Taking over a bar program from Charles Joly is a no easy task, but Micah Melton, who was chef de cuisine at the Aviary under Joly, slid seamlessly into the role in October 2014. 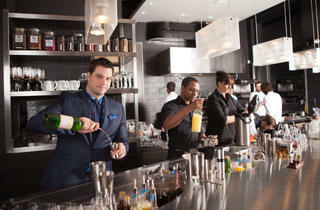 Melton, who moved to Chicago from Iowa at the end of 2010, was hired as the ice chef before the Aviary even opened in 2011. He created dozens of kinds of ice, and now, as beverage director, is in charge of the cocktail lists for the Aviary and the Office, the downstairs bar. We caught up with Melton to talk about how he got his start in bartending, how he’s changed the drink lists and the drink he just can’t get right. 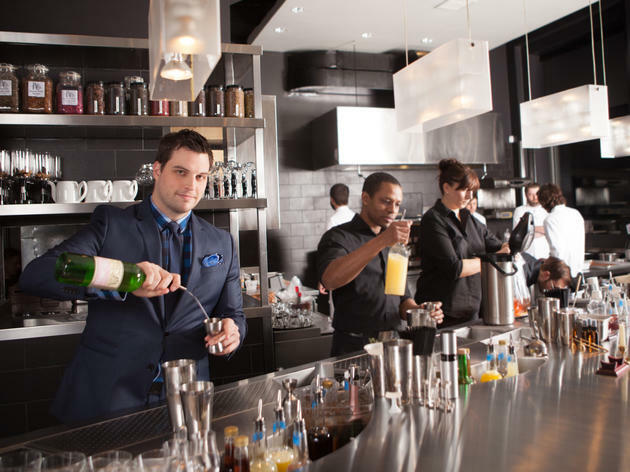 What was your path to getting into bartending? I started bartending while going to culinary school in Iowa. It was just a college bar, and just to pay the bills basically, but that's where I fell in love with the craft, hospitality and face-time with people. I was working in restaurants, too, at the time, and had a couple bar jobs and restaurant jobs, and was a chef at Linn Street Café. How did you get hooked up with the Aviary people? I ate at Alinea when I was in school in 2007, and always followed the group. I really thought Alinea was awesome. So when [Grant] Achatz tweeted that he was opening a bar, I thought it was a natural transition to a culinary-focused bar, so I threw my resume out there. I came to Chicago in October 2010, did a two-day stage, was hired a short time later and moved in December. I started as a bartender before we actually opened, and the guy who was doing ice ended up quitting, so I volunteered to take over in the ice room. I did that for a year, then… I was promoted to sous chef. The sous chef job is more of the research and development, just coming up with new drinks and managing the line. How did you put your own take on the drink list? When Charles was leaving, we had him give us feedback—it would be silly not to get Charles’s opinion. A week or so after he left, we launched the Office cocktail menu. There are seven cocktails down there. Then about three weeks after that, we revamped the Aviary menu. We switched the format and probably 70 percent of the menu is new drinks. For the stuff that’s still on the menu, they’re either things that Charles and I worked on together or that I put on the menu myself. It was a very amiable separation, so I didn’t feel that I had to pull stuff off the menu. What’s the new Aviary menu like? We used to have a big section of prix fixe cocktails, and those drinks were only available on that menu. It was a little confusing for people, especially with tickets, and people were purchasing a three-course menu without getting the chance to look at the whole menu and see what they wanted. Now, everything is available a la carte. Presentations have always been key to the experience at the Aviary. What are some new presentations? One of our new cocktails, Loaded to the Gunwalls, is inspired by the spice trade. It’s served in a glass ship in a bottle, and it comes with a little candle and a brown clay mug. We take the candle and use mace to scent the mug, then we pour the drink out of the ship into the glass and snuff the candle. We let the candle sit on the table for the smoke aroma. Does the presentation come first? Or do you create a cocktail and then think about how to present it? It works both ways. Loaded to the Gunwalls was presentation first—Achatz gave us one of the bottles and said, “This is cool, you should put a drink in it.” So we thought of the spice trade and used cinnamon and Batavia Arrack. How has the Office menu changed? Before Charles left, it was essentially all dealer’s choice cocktails. We have actual cocktails, with a list of ingredients. We’ll still do a dealer’s choice, but the list makes people feel a little more comfortable, and get an idea of what they’re going to get. There’s a French 75 riff, with sauternes, cognac, and sparkling pear cider. Then we take Maytag blue cheese and puree it and distill it. It comes with a half ounce of blue cheese distillation and smells really funky in the glass. Then we pour the cocktail over it and it adds another layer to the cocktail. How has your culinary background affected your work as a bartender? I know flavors and what works in a dish. I think a lot of times in food it’s different than you would think of it in cocktails. Sauternes and blue cheese pair well…and that’s just a natural thing in the culinary world. In cocktails, you see pear and sauternes, but you’d probably put absinthe in. I think about it in culinary terms, since I have more of a kitchen background. You also just made an amaro, Boomerang, with BroVo Spirits. How are you using it? It’s in one cocktail right now on the Aviary menu. It’s kind of like a blood and sand, with Scotch, but instead of sweet vermouth, I used maurin quina, which is cherry-based. Then I used Boomerang in place of cherry liqueur. Then some orange juice and lemon juice and ice cubes made out of orange and cherry. Tell me about your beer program. We have a bunch of collaborative stuff that came out fairly recently, like with Perennial and an Against the Grain collaboration with Fountainhead. Our beer menu downstairs in the Office is ever-expanding and getting out of control. I think people come in and assume just get a cocktail, and I wouldn’t disagree. But beer is a personal passion of mine, and I like to think about things other than cocktails… We have a bunch of cellared stuff, some old barleywines from as far back as 1998. We also have some wines, and I do the Champagnes. We’re fortunate to have Next, since we get leftover wines from old menus and I get to pick from that. Is there anything you’ve been really into lately? Yeah, since picklebacks became cool I’ve been trying to figure out how to make a shot glass out of pickle juice. You wouldn’t be able to tell it was edible until we told you. It would look and feel like a glass, and when we present it to you, you’d say, ‘Where’s the pickle juice?’ Then we’d tell you, ‘Just drink the whiskey and bite into the glass.’ It’s been eluding me for a couple months. What’s next for the Aviary? We’re in the process of trying to re-imagine the ice and the ice room. There’s a good chance that people in general will see a new take on ice. We’re trying to do some new things, put ice more in focus and shed more light on the ice program. I think that’s probably the one thing out of anything that makes us more unique.